“The [above] performance has been around in various guises before, but here it comes up fresh as a morning in early June, thanks to the loving re-creation and restoration by Richard Caniell. A 73-year-old broadcast revitalized to such a degree that it can compete with many studio recordings of the same vintage when it comes to dynamics, lifelike string tone and transparency of the orchestral fabric. The chorus is recorded with great impact – and the quality of the singing anno 1940 is far superior to what can be heard on some later [performances] from the same house. A special treat, as on so many issues of MET broadcasts, is the comment[ary] by Milton Cross, who hosted these Saturday evening radio broadcasts from the Metropolitan for forty-three seasons. Hungarian Svéd already had an important career in Europe behind him before arriving in New York - the BALLO premiere on 2 December was his MET début; in 1937 he had sung Renato opposite Björling at the Vienna State Opera. Bruna Castagna, the only Italian singer in the cast (Moscona, in spite of his Italian sounding name, was Greek) was one of the truly great mezzo-sopranos of the 1930s and early 1940s but is largely forgotten today, probably due to a lack of commercial recordings. Her ‘Re dell’abisso’ is masterly: what grandezza, what intensity and what expressivity! I have left the loving couple until last, since here we have grandezza in galore! Zinka Milanov, who had been on the MET roster since 1937 and continued to be so until 1966, must be counted as one of the great Verdi sopranos of the 20th century. Born in Zagreb in Croatia in 1906, the same year as Alexander Svéd, and making her début in Ljubljana in 1927 as Leonora in IL TROVATORE, she spent the next ten years at the Zagreb opera with guest appearances in Hamburg, Dresden and Prague, where Edward Johnson, Manager of the Metropolitan Opera, heard her and engaged her to the Met. She made her début there, again as Leonora, on 17 December 1937, and sang 460 times at the MET, fourteen of these opposite Jussi Björling. Here, at age 34, she is at her freshest and most radiant…vocally she is superb and her hallmarks, the fearless and ringing top notes and her wonderful floated pianissimi, grace her readings of the two arias, ‘Ecco l’orrido campo’ and ‘Morrò, ma prima in grazia’ where she is heart-rending. She also reigns the ensembles where she takes part, but even better than that is the long duet with Riccardo, ‘Teco io sto’. Here she is both magnificent and loving. One never doubts that this is a woman deeply in love. In the 1955 she recorded excerpts from BALLO with Jan Peerce and Leonard Warren and she sings marvellously there too….Here…she is at her freshest and produces some of the loveliest Verdi singing of the period. 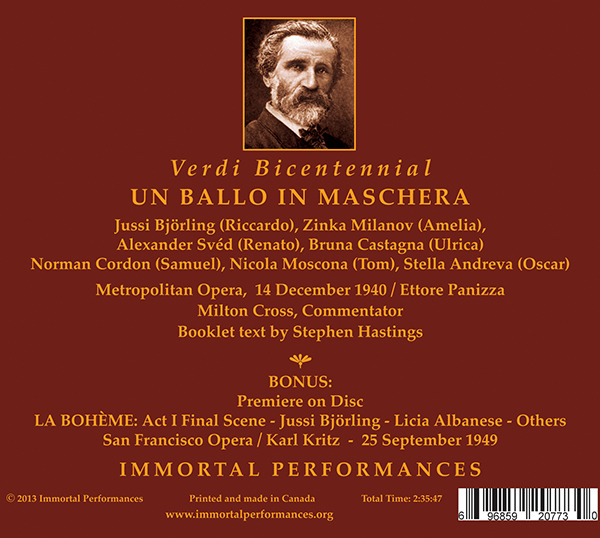 All in all this is a very valuable to the catalogue of recordings of UN BALLO IN MASCHERA, now that it is restored in sound that is more or less comparable with studio recordings from the same period. But the joy is not over there. As a bonus we get the Act I finale from LA BOHÈME, recorded in San Francisco in 1949 with Licia Albanese as Mimì and never before issued. The sound quality is nowhere in the vicinity of the 1940 BALLO but we get yet an opportunity to hear Jussi Björling in his signature role, singing opposite Albanese, with whom he sang the role eight times. "[Ettore Panizza] was blessed with the 31-year-old Jussi Björling as Ricardo and the 34-year-old Zinka Milanov as his Amelia, both in their prime – casting for the gods….At this stage in Milanov’s career, no excuses have to be made for inequalities in her singing: this is an Amelia with all the resources and innate style her music calls for. Act Two with both singers involved and impassioned is thus a vocal feast. Amelia’s Prayer is quite gloriously delivered. With Alexander Svéd, in his Met début, a powerful if unsubtle Renato (his voice has rightly been compared with Ruffo’s), and Bruna Castagna, a classic Ulrica, this is a performance to savour...."
"In this newly-restored recording Richard Caniell has done a magnificent job in recapturing the sound of the voices as projected in the opera house....This is the NBC linecheck of a Saturday afternoon performance at the Metropolitan Opera on 14 December, 1940….In the case of [Zinka Milanov], the sheer rarity of her kind of voice, with its even scale, steady emission, luminous timbre, command of the head voice and unusual combination of litheness and power, has become increasingly evident: there has certainly been no singer at the Met who can equal her in most of her chosen repertoire ….In Amelia’s ‘Morrò, ma prima in grazia’, for example, there is a slightly tearful quality to her phrasing in the 1940 broadcast….overall this is one of the most impressive performances of the role on disc. The fresh soaring sound the thirty-four-year-old Milanov produces is particularly captivating in the love duet, where her voice mingles more seductively with Jussi Björling’s than in any other of their joint recordings…one can really sense the voice resonating in the 39th Street auditorium when it rises above the staff (and this is as true of her pianissimi as it is of her forte). And while Milanov could be rhythmically wayward at times, here she displays admirable aplomb in the very difficult act two trio (with Riccardo and Renato) and act three quintet (with Renato, Oscar and the two conspirators), as well as in the arching ensemble that brings the opera to a moving close. The Hungarian baritone Alexander (Sándor) Svéd, who was the same age as Milanov, had actually made his Met début on the opening night of this production and it was he who had won the evening’s biggest round of applause after his rendition of ‘Eri tu’. Oscar Thompson, reviewing the first performance [of this production] in the New York Sun, described him as ‘the first big-voiced baritone the Metropolitan has had since Titta Ruffo departed’….Svéd’s instrument, trained in Italy by Mario Sammarco and Riccardo Stracciari, was a more unwieldy one than Ruffo’s. Thompson refers to his ‘growl’ and ‘variety of explosive utterances that often blurred both the quality and the pitch’. Defects that are evident in the recording too and highlighted alongside the refined emission of the twenty-nine-year-old Björling (with whom Svéd had already sung this opera in Vienna in March 1937)…. [The] act one aria however shows Svéd at his most interesting, for he sings with a rhythmic freedom that liberates this music from the slightly pedestrian regularity of pulse that often afflicts it in performance, and highlights the emotional import of the words (and Panizza in the pit adjusts seamlessly to the singer’s generous play of rubato)….Svéd even commands a proper mezza voce for ‘O dolcezze perdute’ in ‘Eri tu’, although he does not sustain it long enough for its full effect to be made. Throughout the performance he gives the impression, however, Renato is dealing with a series of life-changing experiences in the very moment they happen to him, and this spontaneity, to which Panizza proves admirably responsive, contributes as much as sheer vocal weight to the overall excitement of his portrayal. From a musical point of view Björling reveals a refinement, both in tone production and musical line, that is unrivalled even when compared to his more stylish Italian colleague Carlo Bergonzi. Riccardo’s opening Romanza, ‘La rivedrà in estasi’, (capped with a stunning A sharp), displays his ability to sustain an expansive (if intimate) melody without any spreading of the golden tone or muddying of the vowels. Equally remarkable is his sonorous but delicate staccato delivery of ‘Ogni cura si doni al diletto’, which sums up Riccardo’s philosophy and establishes the high spirited mood in which the first scene comes to a collective close. And few tenors have rivaled the thrilling vocalism deployed in ‘Sì, rivederti Amelia’ in act three, with its ideally sprung ascent to a ringingly sustained B flat and A. And although Björling himself brought a more compelling lilt, aided by added embellishments…his final scene…is unmatched. In that final scene Riccardo…is watched over by the Oscar of Stella Andreva, the English soprano who had sung the role alongside the tenor at his Stockholm début in the role on 18 April, 1934….The remaining female interpreter, Bruna Castagna as Ulrica, had replaced Kerstin Thorborg at the last minute (she had actually sung elsewhere the very night before this afternoon performance), but her density of tone and projection of words are riveting all the same. She does not respect the full range of dynamics indicated in the score…but the impact of the performance, the seriousness of which suggests that Ulrica is a genuine clairvoyant in spite of the theatrical exhibitionism of her invocation of Satan, is unfailing from start to finish and has rarely been matched. 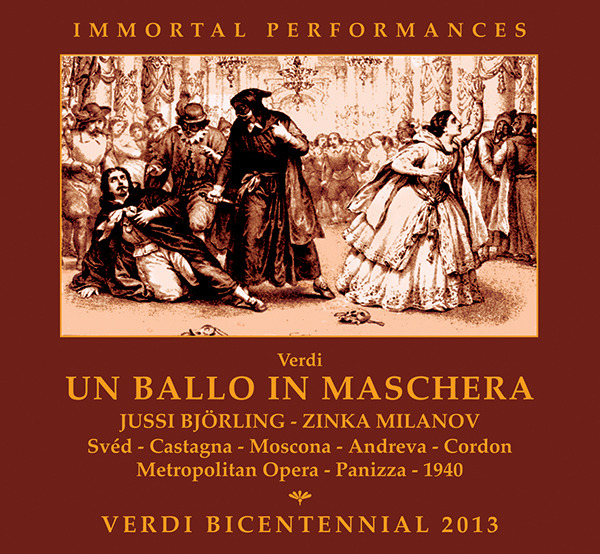 …In this newly-restored recording [Richard Caniell] has done a magnificent job in recapturing the sound of the voices as projected in the opera house highlights the idiomatic involvement of the Met Chorus and Orchestra: the emotional engagement conveyed here rivals that of native Italian ensembles. Great credit is due to Panizza, whose reading combines constant narrative tension with perfectly judged accompaniments of the singing. His strongly contrasting tempi generate much excitement while allowing the music to breathe at all times…. “The [NBC line check, the transcription discs] yielded quite natural sound but when released in the Met set, their sonics had been augmented by filtering, a treble boost which produced quite spurious brilliance….Encountering this, and recalling that the broadcast was sizeable and natural in timbre, finally led me to consider releasing our edition, despite there having been many previous releases [of this performance]. [These transcriptions] revealed the original sound of the now-destroyed transcriptions. Its sound, with a little work, could be made into a very rewarding restoration, the results of which are now in your hands. The bonus part of CD-2 is the final scene from the San Francisco Opera broadcast (Act I, Scene 3 complete, 25 September 1949) of LA BOHÈME with Björling and Licia Albanese. This is taken from a private recording by a man who aimed only at preserving Björling so he did not record Albanese in ‘Mi chiamano Mimì’, nor the shouts of Rodolfo’s bohemian friends from the street. He continued his recording with ‘O soave fanciulla’. In order to provide musical, dramatic and emotional continuity, I’ve brought in Albanese in ‘Mi chiamano’ from a 1948 concert Hall broadcast, as this was closest to the sound of her 1949 voice. I’ve brought in the bohemian friends (George Cehanovsky and Nicola Moscona) from the 1948 Met broadcast. My work to restore this BALLO was to enlarge the tonal values and recreate the dynamics between piano and forte, which the recording limiters flattened. Sound emerges that is comparable to commercial recordings of this era. What one hears documents beyond argument that Björling was among the greatest tenors of the previous century, and, in certain roles, the best voice ever heard in recordings."